Please note that the content of this book primarily consists of articles available from Wikipedia or other free sources online. Elko is a city in Elko County, Nevada, United States. The population was 16,980 at the 2000 census. 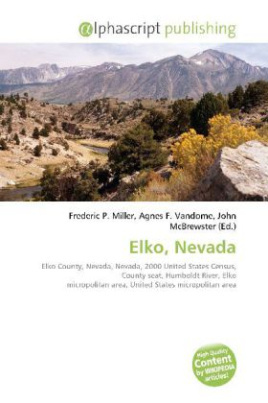 It is the county seat of Elko County. It straddles the Humboldt River. Elko is the principal city of the Elko Micropolitan Statistical Area, a micropolitan area that covers Elko and Eureka counties and had a combined population of 46,942 at the 2000 census. It is home to Great Basin College.